Groundbreaking: With shovels, left to right, Kristin Gellinck-Frye, Principal Anaverde Hills Elementary; Angela French, President, Anaverde Hills PTSA; WUSD Trustee John Curiel, Mayor Jim Ledford; WUSD Trustee Gwen Farrell; WUSD Trustee Linda Jones; WUSD Trustee Steve DeMarzio; Anaverde Home Owners Assoc. Treasurer Rich French. 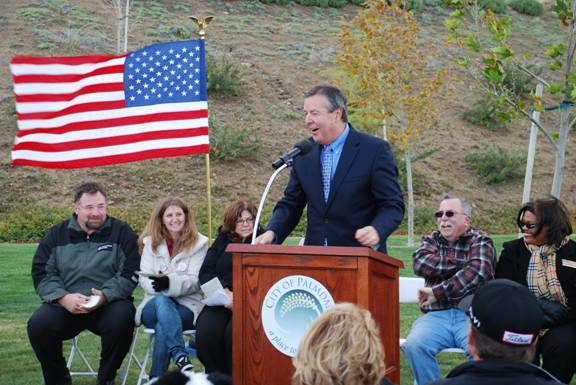 PALMDALE – This time next year, students and teachers at Anaverde Hills Elementary School will finally have a permanent campus to call their own. 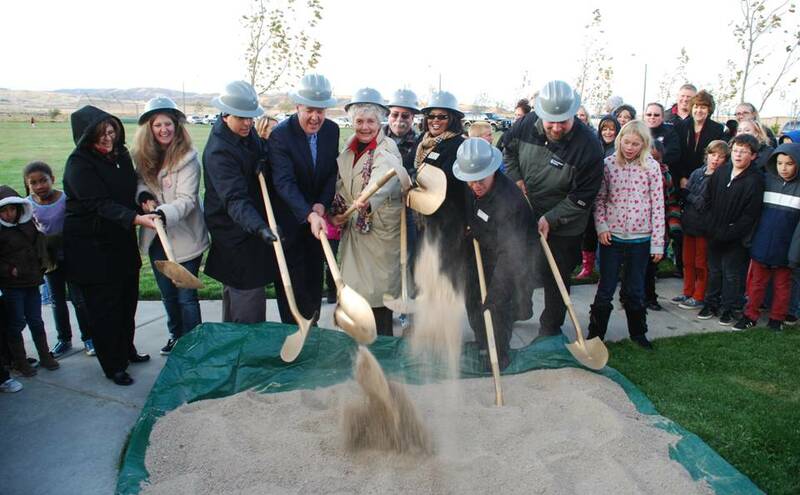 Westside Union School District board members joined teachers, students and local officials Friday at a groundbreaking ceremony to celebrate the permanent site of the Anaverde Hills Elementary School. 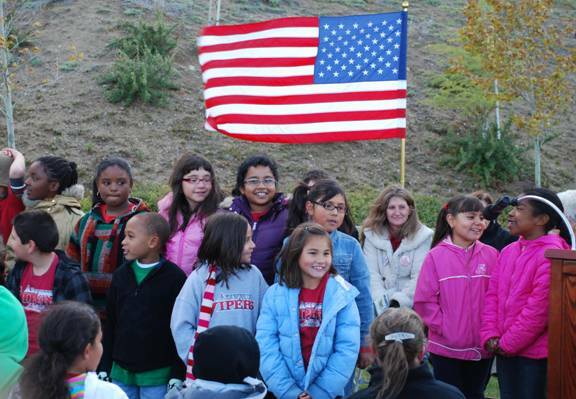 Anaverde Hills School students from Mrs. Dumayas' 3rd grade class singing "The Constitution" song. Rossall says the land is the same piece of property that the developer tried to sell for $3 million about seven years ago. This and many other problems kept construction on the school site in limbo for a number of years as the entire Anaverde Hills community struggled. While awaiting construction of its campus, the school has relocated twice and has been reconfigured twice. It originally started out as a K-8, but was not working effectively and therefore converted to a K-6. The school was originally on a site rented from the Palmdale School District, before moving to the Cottonwood campus about three school years ago. Anaverde Hills students were originally integrated into Cottonwood, but this year, they were separated so that Anaverde Hills Elementary has its own office at one end of the campus, with both schools sharing only a playground and a cafeteria. Palmdale Mayor Jim Ledford addressed the crowd of nearly 200. Despite being transported quite a distance outside of their community every morning and every afternoon to attend school, Anaverde Hills Elementary School students have still thrived. The school was named a California Distinguished School. Rossall says the permanent site should be available by the next school year, and the transition to the new site should go smoothly. “Our board has worked very hard on getting this school accomplished, so I’m very pleased for them that it’s finally coming to fruition,” she added.